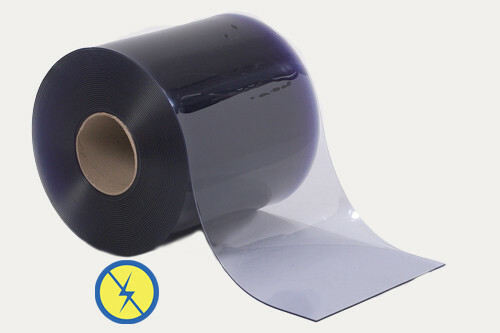 PVCStrip.com Anti-Static material is a clear, smooth PVC formulated to dissipate static electricity harmlessly away from personnel or sensitive equipment and also provides good sound attenuation. This material is ideal in facilities where there is extensive dust or where static build-up may be an issue. Anti-Static material can be used internally where temperatures range from 0°F to +150°F and also be used in exterior doorways and dock enclosures. Bulk rolls are especially convenient in applications where multiple doors exist, and are generally just an excellent way to keep your facility’s strip door stocked with material, at a lower cost.